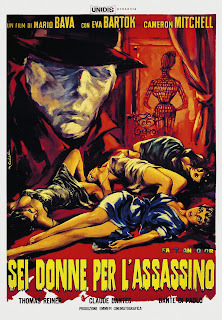 Blood and Black Lace might not be my favorite of "Super" Mario Bava's films, but I can certainly acknowledge its place in Italian giallo films. If, on the off chance, you haven't heard of giallo or the long shadow it casts on American slasher films, it might be surprising to discover that they're less strictly horror films and more like police procedurals, punctuated with "murder set pieces". A masked killer will stalk someone (usually a lovely young woman) in the dark, scare them a bit, and then kill them, often with increasingly unique or cruel implements as the film goes on. What distinguishes it from slashers is the balance of screen time devoted to a local detective or member of the police, who is desperately trying to catch the killer before they kill again. In the case of Blood and Black Lace, the ending is also more conventional than modern horror audiences might expect, but still effective. The Christian Couture Fashion House of Rome has its share of secrets beyond its latest designs, and a masked killer is taking out models one by one, beginning with Isabella (Francesca Ungaro). After she leaves on a dark and stormy night, Isabella never makes it home, instead strangled to death near a tree. Police Inspector Silver (Thomas Reiner) begins his investigation, but neither Christian Couture house owner Contessa Cristina Como (Eva Bartok) nor her business partner Massimo "Max" Morlacchi (Cameron Mitchell) know anything that would help him. The other models, including her roommates Peggy (Mary Arden) and Nicole (Arianna Gorini), seem hesitant to say anything, and the discovery of Isabella's diary sends ripples throughout the house. What secrets was she keeping, and who was implicated? Who could the killer be? Max? Designer Cesar Lazzarini (Louis Pigot)? Aristocrat Ricardo Morellin (Franco Ressel)? Antique Shop owner Frank (Dante Di Paolo)? Or is it groundskeeper Marco (Massimo Righi)? If you're accustomed to slasher films, the procedural elements of Blood and Black Lace might come as a surprise - they significantly diminish the tension you might be used to. When the killer is about to strike, Bava ratchets up the tension considerably, and many of the murders are (for 1964) pretty gruesome. With kills that include and antique spiked mallet, a drowning disguised as a suicide, and one of the models getting up close and personal with a very hot wood stove, I don't think you're going to be disappointed in that department. That said, if you've seen Jean-Pierre Melville's Le Samouraï, the back and forth structure between cops and criminals will be familiar (and yes, Blood and Black Lace came out first, but I use Le Samouraï as a good example, particularly in reference to the "lineup" scene in the police station). Despite the grounded, procedural elements, much of Blood and Black Lace has a dreamlike, slightly surreal quality. As with much of the Mario Bava films I've seen, tone is key, and while almost everything is strictly grounded in reality, the camera movement and shot composition lend the film a sense of being unreal. When Bava transitioned from away black and white, he adopted to strong, lurid color scheme of deep reds that borders on expressionistic. While set in the real world, Blood and Black Lace has the heightened quality of a dream world, and the influence of his vivid colors on Dario Argento (especially in Suspiria) is evident. There's a floating, POV camera shot towards the end of the film that moves through the fashion house that reminded me strongly of Suspiria. The camera moves between (or sometimes knocks off) wire-frame mannequins, bathed in red for no apparent reason, as it moves towards someone in the darkness. While what follows is almost too conventional for many horror fans - the ending wouldn't be out of place in a film noir - Bava sets it up as though the supernatural were intruding on the story. While I won't delve into SPOILERS, it is worth mentioning that you can easily surmise who the killer is just by looking at their face in the mask. There's a split-second reveal of the face during the stove scene, in which the increased clarity of Blu-Ray can confirm your suspicions (you don't even need to pause it), but the mystery of who the killer is ends up being only half of the equation. There's a "twist" to speak of, one that was borrowed decades later by Wes Craven, one that's instrumental to disrupting the "procedural" portion of the giallo. 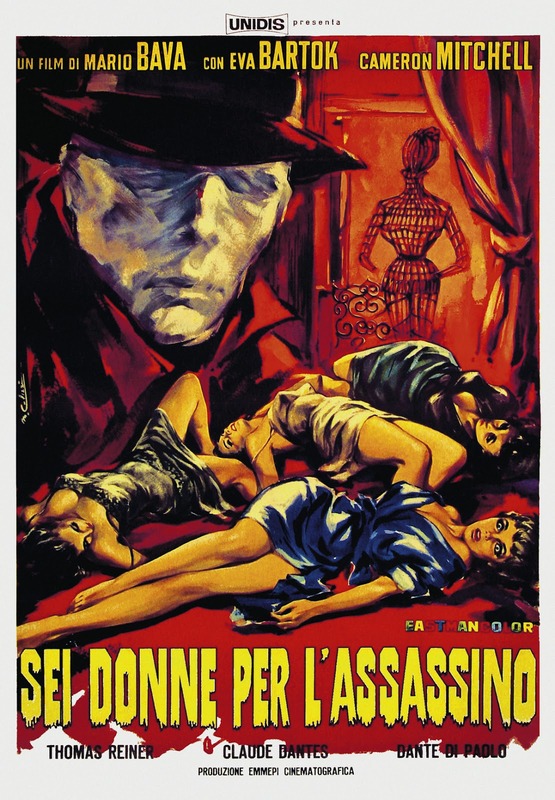 While other directors would take up the giallo over time and sometimes improve on it, there's something to be said for Mario Bava, who created it with The Girl Who Knew Too Much and laid most of the groundwork / rules in Blood and Black Lace. I might prefer Black Sunday and Planet of the Vampires, but there's something to the way he balances tonal dissonance in Blood and Black Lace that's admirable.